Make faux Mercury Glass pumpkins out of Dollar Store cheesiness. Another Dollar Store pumpkin transformation… faux Mercury Glass. This is sooooo dang easy. Immediately, while it is still wet, lightly spray it with metallic silver paint. Krylon has a good one. This is outdoor paint, but any silver paint will do. I removed the autumn elements from my Fall window ledge and added in more orange, silver and black. I love the muted colors. I love the birds. I am not a gory Halloween person… I’m more a E.A. Poe kind of girl. We have a big storm coming through tomorrow, so I’ll have some stick projects soon too. You know how I loves me some sticks. Quote the raven… ” Nevermore” Love the transformation.. I was thinking about the mirror paint and what would happen with that! You are officially the Queen of pumpkin transformations! I saw these the other day and convinced myself I didn’t need….hmmmm. See that? You take something that I’ve done…sprayed too soon…and turned it into something awesome!! I love how you can see potential in stuff like that!! I love The Raven!! I read it to my kids two weeks ago…unusually early because I just love it!! We’ll read it a few more times before Halloween, too!! I’m with you, an eerie look is what appeals to me!! Black birds, twisted and crooked sticks, an old picture…maybe some old items looking sort of out of place and lost…. Sorry, I think I’m channeling The Addams Family. I’ve always loved Morticia!! Dollar store cheesiness – love that! Classic! =) Your pumpkins look amazing now! Gotta love the dollar store!! I made similar pumpkins for halloween over at my blog too:) I like your technique with the silver over the wet black paint! I’ll have to try that next time! It’s funny you mention sticks because I’ve been wanting to go out and collect some for a project myself. What a hot crafting item! And I can’t wait to see what you do with it next year. LOL Cuz I KNOW you will change it up! I have been wanting to make one of these and couldn’t quite figure out how to get it to work. Brilliant, Vivienne! Oh Boring Viv. I think I’m going to nickname you Punkin! Thanks for the tutorial. I didn’t realize they were that easy! Love the pumpkins!! Great project!! Boring is never a word I would use to describe you! You always deliver and for that I love you! That pumpkin is awesome!! I need to do that now! BORING? You, my lovely beautiful friend, are NEVER boring. I agree with Connie. During the months of Sept-Nov, we need to nickname you pumpkin! You do fabulous things with pumpkins. < --HA! That sounds inappropriate. Is that a fake bird? I think it is but it looks real. Did you stuff a bird? Oh, really clever. And now I’m a new follower. On the pallid bust of Pallas just above my chamber door; (Hee hee, couldn’t resist) Very fitting for Halloween decor! What an awesome idea! I love the look of it and will definitely have to try this. Cute! My attempts at mercury glass failed miserably. Thanks for this tut! I’m always looking for new ways to try and get it right. I’m loving it- and sharing it on FB 🙂 Thanks for linking up at Feathered Nest Friday! Wow! Cool technique and awesome outcome! So neat. What a great use of dollar pumpkins. It would be great to have you join me at Seasonal Sundays. SO adorable! What a clever idea! Love this look. A great transformation from a dollar store pumpkin. Love the pumpkin! I used some of the Dollar Store Foam pumpkins for my Halloween Decor this year too! Wow what a cool effect you got on that pumpkin, and really nice display of fall elements you have going on there! Great transformation! Gorgeous fall colours. Thanks for sharing. Black twig and pumpkin Halloween porch decor. Fifty shades of pumpkin. 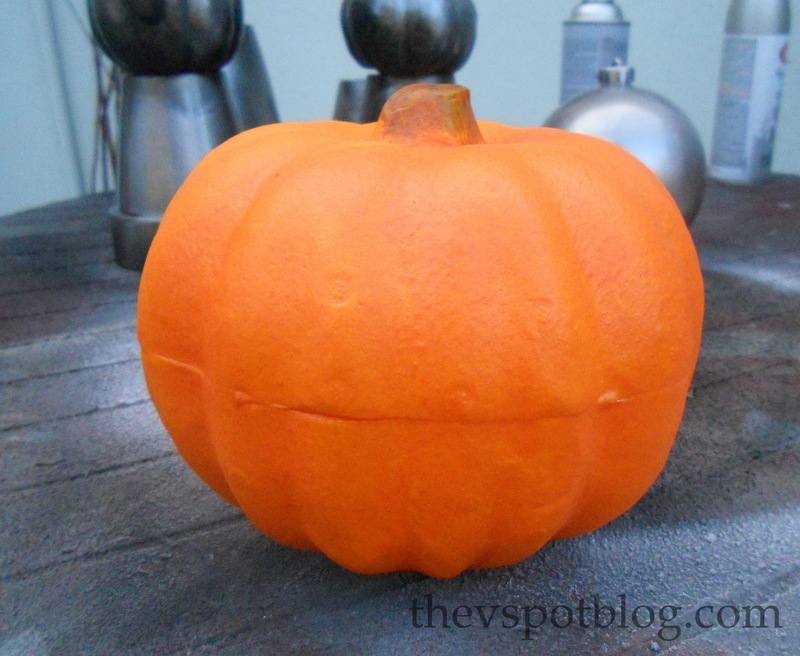 No-carve pumpkin ideas. Easy Damask Pumpkin using trashed craft supplies. Easy chain covered pumpkins for Halloween.